The Saskatchewan Craft Council Board of Directors is responsible for the overall governance of the SCC. It establishes policies and ensures that they are adhered to. Board members serve a three-year term and they are chosen on a rotational basis at the SCC‘s Annual General Meeting held each spring. I am interested in serving on the Craft Council Board because it is at a pivotal time in its history; between the generation that founded it and the new generations of craftspeople looking to it for support and leadership. I am impressed with its progress and outreach and would like to offer my board experience to an organization that is growing and changing. Elisabeth is a glass artist and a Professional Craftsperson member of the SCC. 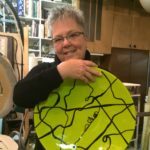 She has been a member of the Saskatoon Glassworkers Guild for the past six years and co-chaired the education committee for two years, co-chaired the “Colour Outside the Lines” Glass Guild show at the SCC gallery, and proposed and completed a number of special projects. This is an exciting time in the board’s development and she is glad to be a part of it. Elisabeth enjoyed her first term, and the challenges encountered, with the Saskatchewan Craft Council. 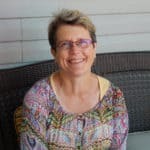 She is a member of the Governance Committee and the Evaluation Committee and helped revamp the SCC governance policies so they are more effective, efficient, and easy to review and update. Elisabeth feels that Board’s responsibility is to determine and set, through consultation with its membership, a plan and path for the growth of fine craft in Saskatchewan and then allow the Administration to carry out that plan. The Board then monitors that plan and ensures it fits into the financial resources available. Recently the board has strengthened the governance of the organization and established a process for ongoing review to ensure the organization is always up to date. Elisabeth sees the organization’s future as one that is committed and connected to its membership in many ways. The strategies and activities of the Board have increased the awareness and reputation, with the general public, of what craft is and the contribution it can make to quality of life in the province. 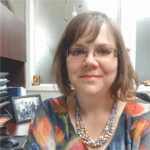 She sees the future of the SCC as an organization that is financially viable, creative in its activities and offerings to its membership and innovative in its strategies and operations. Now, as a board member, she feels her goal is to work towards making this happen. Lori Steward brings a diverse skill set the Board of Directors of the Saskatchewan Craft Council which includes a technical, scientific background; she holds a Bachelor of Science in Mathematics and Computer Sciences from the University of Québec. In addition to her extensive work in the settlement sector helping newcomers to Canada achieve full and successful lives, she has worked as a programmer analyst and graphic designer. She is currently the Community Connections Manager of the Global Gathering Place. Lori has an interest in fine craft and is looking forward to a future in which she has more time to pursue this avid interest. In the meantime, she is hoping that her work with the SCC will dovetail with her interest in settlement by empowering newcomer makers to pursue fine craft in Saskatchewan. Ms. Steward lives in Saskatoon with her husband and two daughters. David Freeman began playing Guitar in 1970, learning to repair his own instruments in 1974. In 1980 he completed Lutherie Training and began TIMELESS INSTRUMENTS. 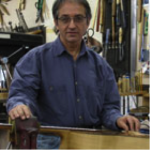 His Choice to build all-fretted string instruments reflects his interest in multi-media art. His artistic background includes pottery, drawing, sculpture, farming, and raising a family. In 1986 David began teaching a seven week Lutherie Training Course. Presently, Freeman offers Lutherie Training, Mail-order Lutherie Supplies, and custom-built string instruments for a global cliental through his company Timeless Instruments. David has been a Village councilor in Tugaske for one term. David has also sat on the Vocational Schools Advisory committee to the ministry of Advanced Education & Immigration. 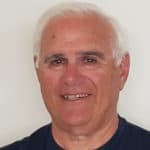 David served on the SCC Board from 2001 to 2003 and 2014 to 2017. He is currently in a second term. He is also the Saskatchewan Representative for the Canadian Crafts Federation. As my business life was winding down, I felt the need to be creative, to become a maker. As I have always enjoyed wood, and made my first bowl in Grade 12, I was eventually drawn to woodturning. From my association with other turners, I became aware of the SCC and it’s place in the Saskatchewan arts community. When asked to become a board member, I quickly volunteered. This is a very dynamic organization that fills a real need in our community. I live in Saskatoon and have a small shop in my garage. My involvement in craft began when I enrolled in David Freeman’s lutherie school, Timeless Instruments, in Tugaske, SK. I was immediately drawn to the way that I, as an instrument-maker, was able to shape not only the wood, but the sound it produces as well. The pursuit of excellence in lutherie brought me to Michigan for more training, then to Montreal where I worked as a luthier’s assistant. After spending some time in the guitar industry, my wife and I decided to make a change. 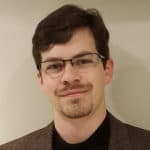 We moved back to our native Saskatchewan, and I am currently working towards a master’s degree in accounting at the U of S. My goal is to build myself a wood-working shop after I have earned my CPA designation. In the meantime, song-writing and playing guitar fulfill my drive for creative expression. For me, woodworking is an outlet to blend my creative side with practical pieces. Like many, I started off building small craft items like recipe boxes and as my skills grew, graduated on to larger and more complex works. Traditional joinery, whether it be mortise and tenon, dovetails, or other forms have always fascinated me, and I incorporate them into my works whenever possible. In 2015 I fulfilled a long-term dream and turned my hobby into Natural Inspirations Woodworking, with a goal of creating unique one of kind pieces that will become family heirlooms. I see the Craft Council as a pivotal organization in helping new and experienced craftspeople develop their skills and find new markets for their products. 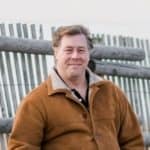 As a recent member of the Saskatchewan Craft Council, I feel privileged for the opportunity to participate as a member of the Board of Directors. As a member, I would not only like to see the Council continue their valuable work but also to grow and be able to adjust to meet future opportunities.